From Chronicle Books. Choose which of the mighty Avengers you want fighting your corner and defending your notes. 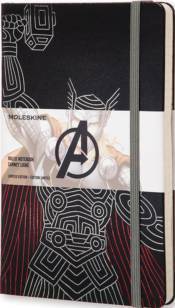 Each cover features a striking freehand metallic line drawing of either the Incredible Hulk, Captain America, Ironman or Thor. Graphics continue on the notebook endpapers and on a special set of Avengers stickers inside. With artwork exclusive to Moleskine, comics fans pick your superhero.